Card games are a great way to pass the time with friends, family, or even by yourself. The traditional Solitaire Card Game has been around for centuries, and still remains a fun and popular game today. You can play it with a deck of conventional playing cards or use online apps or software. Here we’ll go in-depth with everything you need to know about Solitaire. We’ll give you some of the fascinating histories of the game, and then dive into the rules, and how to play. Finally, we’ll offer tips and strategy to help you make the most of your skills. Playing cards have been around as far back as 10th century China, but the card game Solitaire emerged in the 18th century in the Baltic area of Europe. Also referred to as “Patience” in European countries like France, Germany, England, and Poland, some believe that the game started as a means of fortune telling similar to reading Tarot cards. While there is little recorded history to trace the origin of the game, scholars believe prominent historical figures like Napoleon played it in his exile. This may be the reason some variations of the game were named after him. The first appearance of the solitaire card games and particulars appeared in Lady Adelaide Cadogan’s Illustrated Games of Patience that was printed around 1870. Today, there are several different varieties of the game. The most widely played version is called Klondike and is part of a standard software package that comes with PCs and laptops. You can also play the game with a deck of traditional playing cards. You can get started with traditional Solitaire by either downloading the game or an app on your phone or computer or with a pack of cards. Here, we’ll give you detailed instructions on how to play regardless of which way you prefer. If you decide to use physical playing cards, you’ll need a standard 52-card pack. You’ll use all of the cards except Jokers for this game. There are two main objectives of the game. The first is to play into position your cards to build up a foundation in sequence and in suit, ace through king. The ultimate goal is to build the whole pack of cards into those same foundations. If you can do that, you win the game. Below we’ll discuss the details of foundations and how you can move cards into position to achieve this goal. In Solitaire, the Ace is the lowest card in the deck. From there, the cards rank sequentially with 2, 3, 4, 5, 6, 7, 8, 9, 10 and then through the face cards, Jack, Queen, and the King is the high card. To play Solitaire, you’ll first need to become familiar with the terminology. To that end, there are four different types of piles to remember. The Tableau is one of seven piles that make up the main table. To form it, you’ll start from left to right as you deal your deck placing the first card face up to make the first pile. You’ll then deal one card face down for the next six piles. Once that’s complete you’ll begin again from left to right, placing one card face up on the second pile, followed by one card face down on the third through seventh piles. Continue this pattern of placing one card face up and the rest face down until cards on every pile have one card facing up. Your seventh pile should have one face up and six cards facing down. The Foundations are the four piles on which a whole suit or sequence will be built. In traditional Solitaire, the four aces are the bottom card or foundation base, and the piles are hearts, diamonds, spades, and clubs. When you first begin, your foundation pile won’t yet have any cards. The Stock Pile: Also referred to as the “hand pile,” the stock pile is what’s left from your pack of cards after you lay out your Tableau at the beginning of the game. These are brought into play according to the rules as you go. Once you’ve dealt your Tableau, your stock pile is placed face down above it. The Talon: Sometimes called the “waste pile,” this is where you’ll place cards from the stock pile that have no place on foundations or in the tableau. When you begin to play, this pile will also have nothing in it. Begin the game by building your tableau. This is done by transferring cards among those that are face-up so that they fall into sequential order as you begin building your pile. Some cards won’t be able to be played yet until other blocking cards are removed. For example, if among your seven face-up cards you have one five and one six, you can transfer the five on top of the six to begin building the pile in that sequence. Once you moved the five, you unblocked a face-down card that you can now turn over and play. As you make transfers and build sequences, you’ll want to keep a lookout for the aces. When you uncover one, place it in one of the foundation piles to begin building. 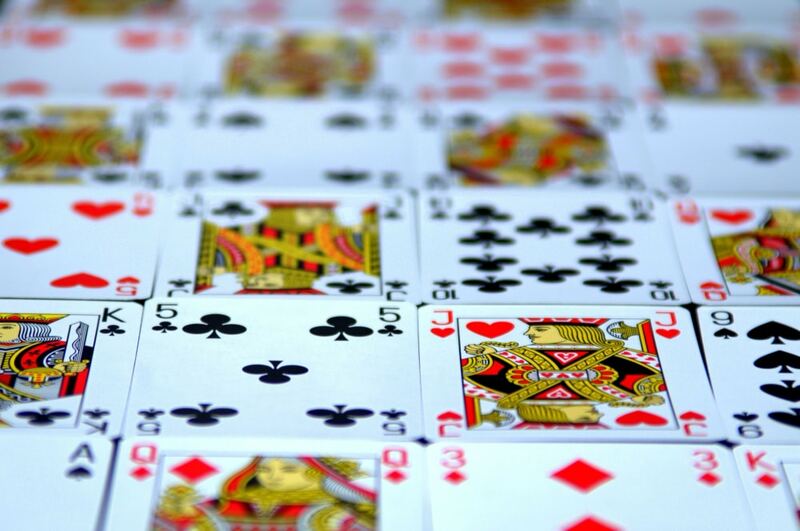 Here you will place the cards in sequence from ace to king and by suit. If you come to a point where you can’t move any more face-up cards, utilize the stock pile by flipping over the first card. You can play this card in either the tableau or in the foundations, according to the rules. If there is no place to play the card, move it to the waste pile and turn over the next card in the stock pile. In the event that there is a vacancy in the tableau once you’ve placed all of the cards elsewhere, you can use that space to manipulate the tableau. This is a critical strategic moment. Open areas can only be filled with a king, and many times this could unblock one of the facedown cards in a pile you haven’t yet been able to access in the tableau. The game continues for as long as you can transfer cards within the tableau or bring cards into play from the stock pile. To win, you must build all the cards into suited sequences in the foundation pile. While we discussed the rules of basic Solitaire in the guidelines above, it’s important to note that they will change if you play any number the number of variations available today. In Lady Codogan’s original Illustrated Games of Patience there were only 24 games listed, but in today’s most authoritative reference, there are rules for over 250 different games. The rules may vary slightly depending on which version you play, so it’s important to be familiar with your game of choice. When in doubt, you can always use resources like Solitaire Central Rulebook to check that you’re playing the right way. While you’ll need a bit of luck to beat the game in Solitaire, strategy and skill are two key ingredients to the equation too. Here are a few tips to help you master your gameplay and even the odds. Complete all available moves in the tableau before you draw from the stockpile. This should always be a last resort option. Only place cards in the foundation piles if you’re certain you won’t need them to anchor lower-ranked cards from the tableau or stockpile. Whenever possible, move the cards that will show you cards you can’t see. For example, if you have a seven showing on the tableau and a seven in your waste pile, move the seven in the tableau so that you can see what’s below. If a card appears in the stockpile that you can’t use in the tableau, but you have room for in the foundation, place it there. Try to keep yourself organized from the beginning and build sequences by suit across your piles. For example, if you start with the eight of hearts in one pile and eight of clubs in another pile, try to build the sequences in each using only hearts and clubs. This way, when you uncover the Aces, you have a pre-made ascending sequence that will make it easier to clear both tableau piles. As we mentioned before, there are hundreds of one-person card games to choose from. Once you’ve mastered the basics, you can play solitaire card games like Spider, Pyramid, Forty Thieves, FreeCell, Golf, or TriPeaks to throw in some variation and change it up. Regardless of which option you choose, be prepared to put on your thinking cap and use your skills, creativity, and ingenuity to beat the game. Not only will you beat boredom and have fun, but you’ll also give your brain a workout in the process.